Hope all us yanks had a safe and fun holiday! ...and for everyone else at least it was Friday, right? Army Selection - Playing in the Heresy we both chose from the FOCs from the FW books, which I took to incorporate the detachment rules from 7th (everyone is scoring, troops get objective secured), but that may have been incorrect in retrospect. Nevertheless, it played well and that's what's important, right? I went with a fairly maneuverable force of Predators and Javelins backed up by an assault squad and the requisite big blob o' tac marines. 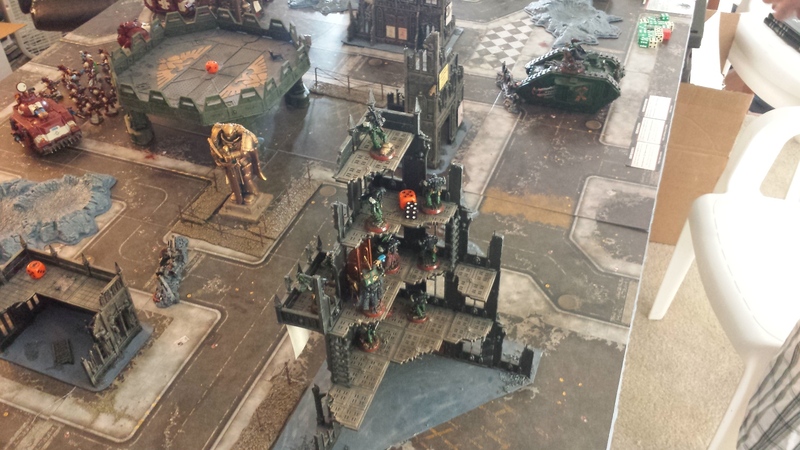 Dave arrived with an equally mobile force of ten man tac squads in rhinos and a melta support squad, and assault terminators in a Land Raider, which was a worry as I realized I didn't have much in the way of melta to deal with it - I would be relying on the 'death of a thousand cuts' with the lascannons on the preds and speeders hopefully hull pointing it to death! Tactical Objectives - We played the "Spoils of War" mission to give the new tactical objectives cards a go, and we both remarked that they really seemed to keep the ebb and flow of the battlefield going, as each turn we each claimed VPs and new objectives were revealed. I really felt that it gave the game a needed shot of activity, rather than the interminable last turn objective rush. It meant that we both made some mad rushes across the table to accomplish the various tasks revealed each turn, the Thousand Sons assault marines agility served them well in this regard, and the Salamander Rhinos' move through over meant they were high-tailing it worry free across the rubble and crater-strewn warzone. Psychic Phase - Both of us had psykers so we were able to give the new psychic phase a go. To be honest, I quite liked it! I'll be interested to see what sorts of boosts the Thousand Sons will get when their book is eventually released, at the moment the Heresy librarians are (with a couple exceptions) restricted to being level 2 so we had a fairly even playing field. 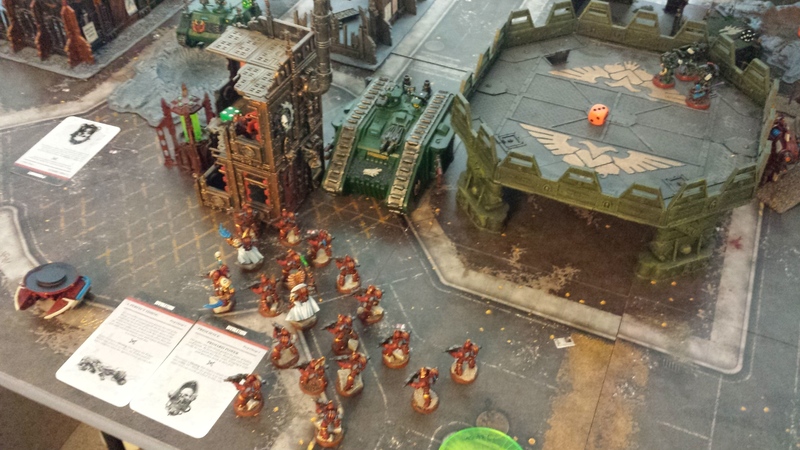 The Salamanders went Pyromancy (naturally) and the Thousand Sons went Divination - Choosing all the powers from the same discipline giving you the primaris power for free was a nice little bonus. Oddly the psychic hood apparently hasn't been invented in the Heresy books yet (heh), so while Dave wasn't able to deny any of the Thousand Sons blessings (and I had no offensive spells), I had passable success avoiding the Salamanders psychic attacks on my units (When it hits, Molten Beam is very nasty). Shooting Phase - Not a lot of changes that stood out in the shooting phase, though I do like the change to the shooting order of operations. Resolving all the weapons of one type before moving on to the next definitely made things smooth and clear, avoided the whole "okay, these two blue dice are S7 AP2, these ten reds are S4 and the white one is the sergeant's precision shot, wait what's this green one again?" thing. 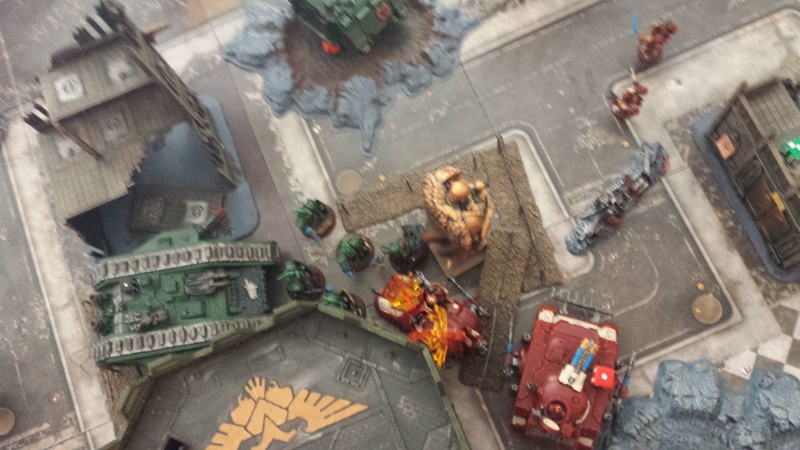 I had planned a two pronged assault on the unit of marines holed up in one of the buildings, but the predator had two Gets Hot malfunctions and the assault marines failed their charge distance (the reroll was actually worse than the original failed distance). 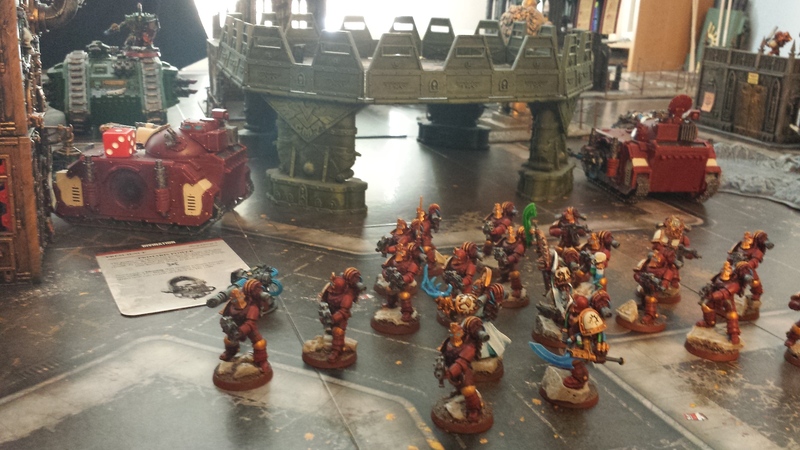 In retaliation, the 20-strong Thousand sons tac squad unleashed their Fury of the Legion on the melta support squad and the Salamander Librarian that was with them. After the unit was washed away, the Librarian had to make 18 saves on his artificer armour. He didn't make it. 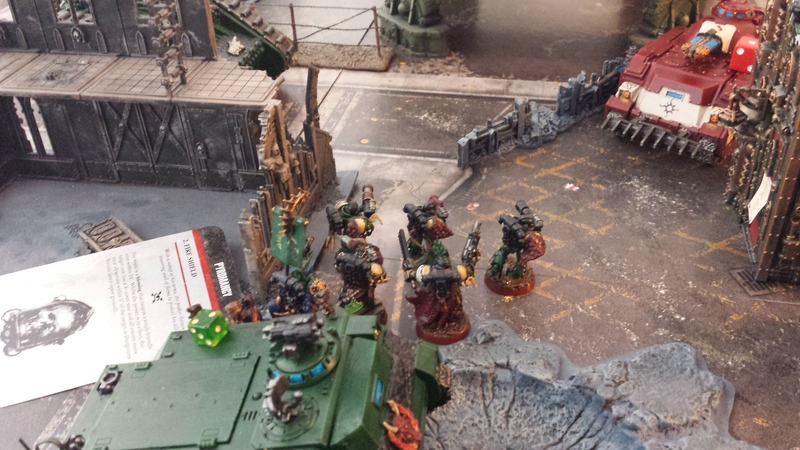 However, the Salamanders were about to retaliate for the retaliation! I remembered the Land Raider had heavy flamers in the hull mount (eep!) and all I had to counter it was a single power fist. The flamers wiped out a quarter of the unit and the sergeant managed to take a single hull point. 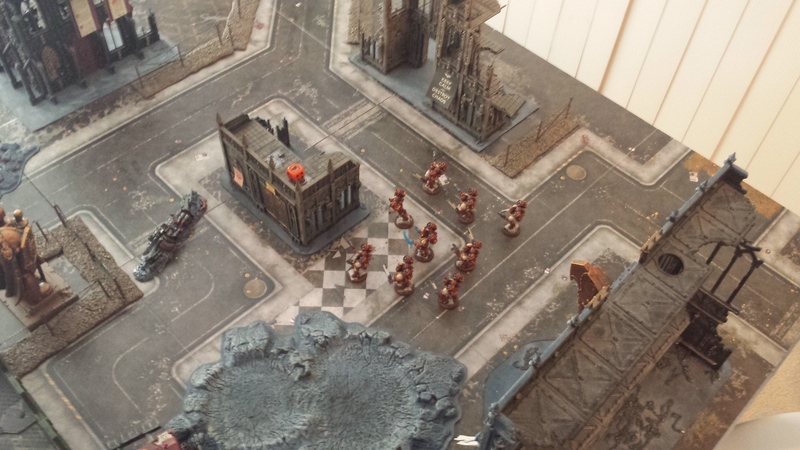 Luckily for the Thousand Sons, that was the bottom of turn 5 and it was getting too hot in the hobby loft to play further. We totted up the VPs and the Salamanders pulled off a win 11-9! 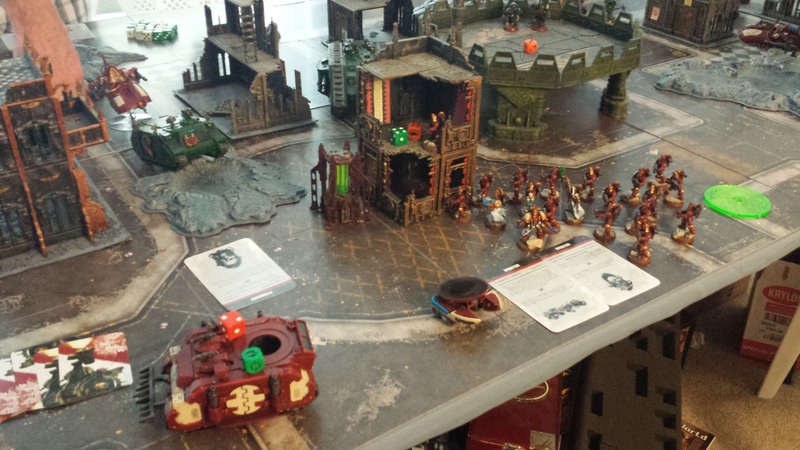 All in all I really enjoyed my first game of 7th edition! Really felt as though the system had a bit of fresh air pumped into it, and I'm quite looking forward to getting some more games in! 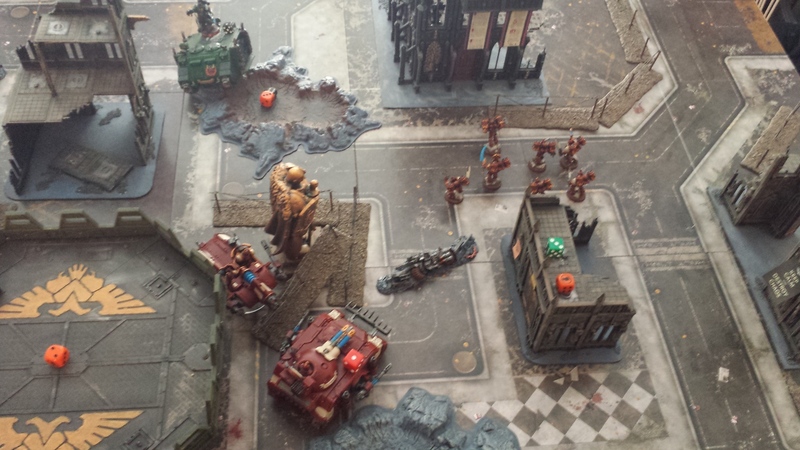 Were doing our first tactical objective game tonight - should be interesting. 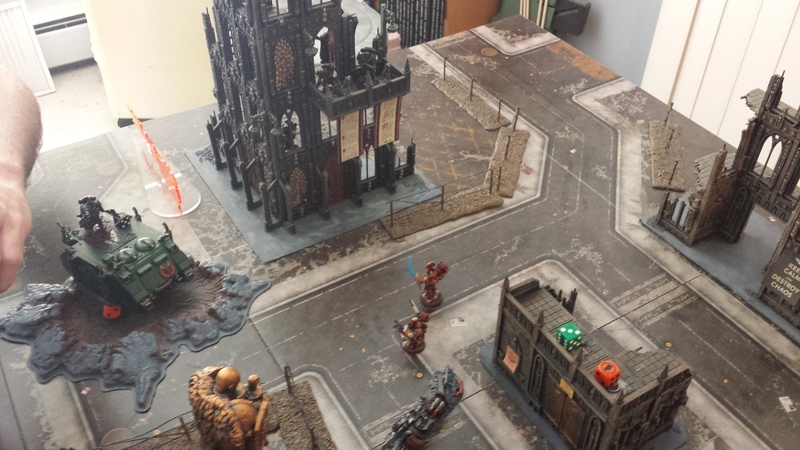 Playing in a HH tourney in a couple of months with custom Heresy objectives... so need to get in the practice. Looks like a great game! I have been liking 7th edition a lot with the new objective cards. It has forced my local meta to shift to well balanced, fast reacting lists, which is unbelievably refreshing! 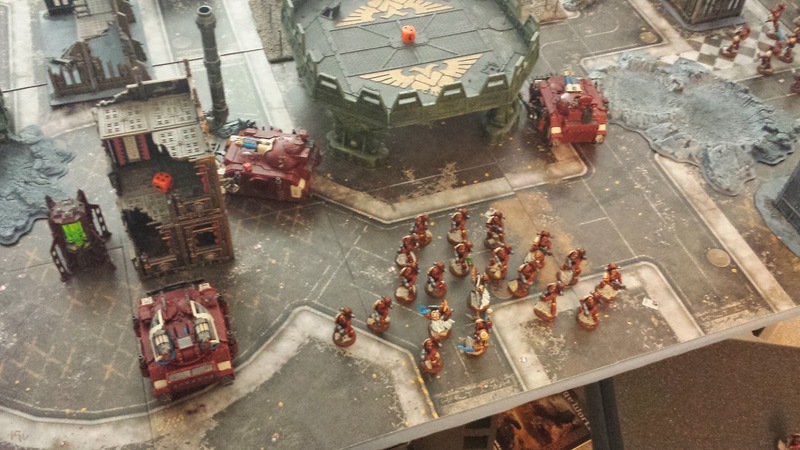 Your army looks great fielded on the table as well man, so keep up the good work. Should be having my first 7th edn. game next week. I love the board - very atmospheric. Did you play the new the objective cards - my fear was that they would slow play down (and I'm a slow player "what's the S of a plasma gun" - 7, for the 20th time!)? Great report, and a nice table to play on to boot! @Paul Bradley: Thanks! Really been enjoying the Heresy! @LuckGod: I was pleasantly surprised with the new rules! @Damn The Valley: Good times were had by all! Really digging the tactical objectives. @Calas Typhon: Thanks! Aye, the tactical objectives really added to the game in my opinion, didn't really slow things down at all. Looks like a blast and they look great on the table! That table looks great sir. 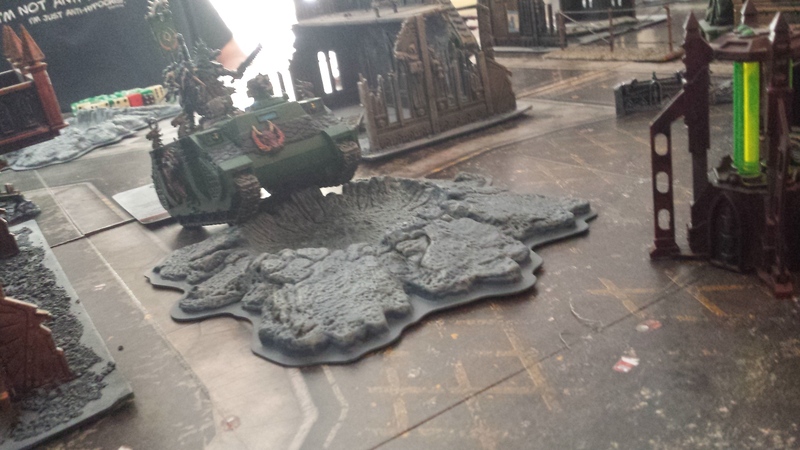 The battleboard thingies really are quite nice. Congrats on a fun game with really nice models. Sounds like 7th could be interesting should I ever go back to GW games.